The Austin Walnut 24 Inch Stool, offers a rich and attractive design style featuring a counter height casual stool with an X-back design, smooth leather like upholstery on the seat and back, and embellished with nail head accents, while finished is a warm and delicious brown color tone that immediately command your attention. This stunning stool creates a fun and interesting atmosphere when paired with your favorite pub table and welcomed to the dining spaces of your home. The Austin Collection promises to elevate the décor of the dining arena in any home, making every dining opportunity a special event! 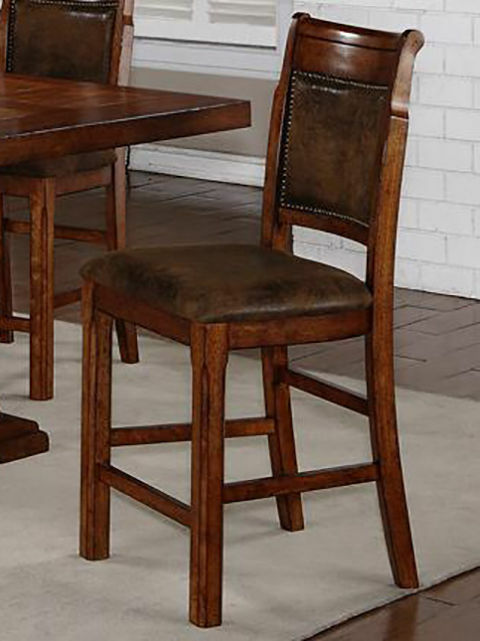 The Austin Walnut 24 Inch Stool, offers a rich and attractive design style featuring a counter height casual stool with an X-back design, smooth leather like upholstery on the seat and back, and embellished with nail head accents, while finished in a warm and delicious brown color tone that immediately commands attention.